One could advance, without fear of being contradicted, that it is hardly usual today for Women to wear full Dress Gowns, as it is for Men to wear Suits à la Française, with the hat under the arm, and the sword at the side. These Toilettes are no longer made but for pageantry Assemblies, such as the Wedding Assembly, the Bals parés, the great Meals, and others, which are in very little number. This has justified our not having given representations of these Parures often, and of only being applied to giving drawings of current and light Toilettes, as it were. 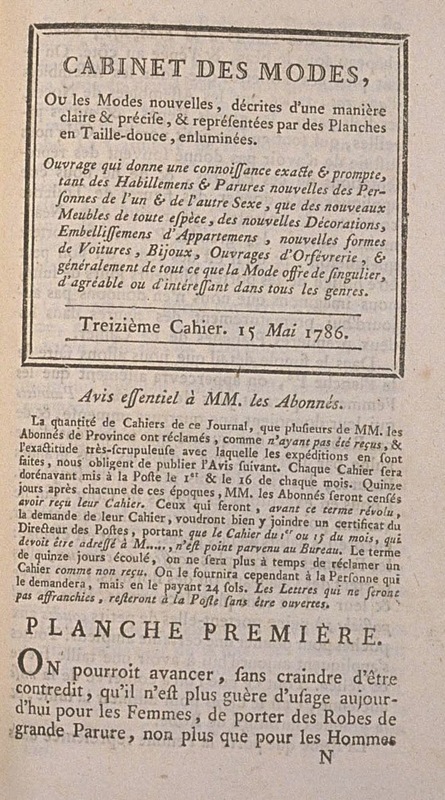 However, as the great Parures are worn sometimes, and it is the times when one can be obliged to wear them several consecutive days, we imagine that we do not prematurely give these figures in the first two Plates of this Book. 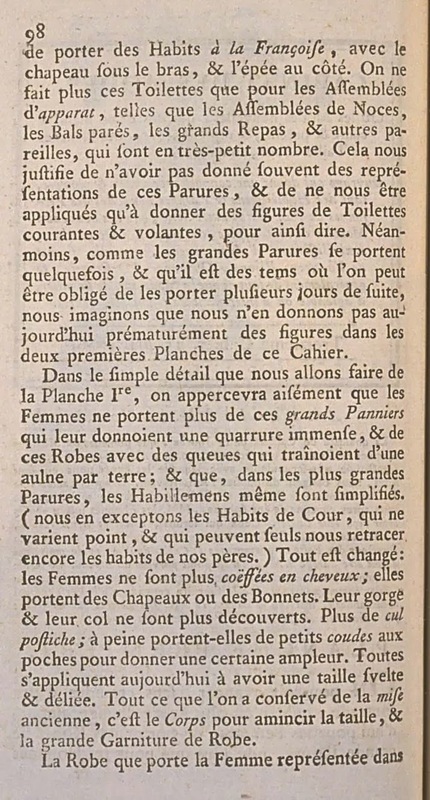 In the simple detail that we are going to go into the 1st Plate, one can easily perceive that Women no longer wear the grand Panniers which gave them an immense stature, or these Gowns with trains that trail an ell on the ground; and that, in the grandest Parures, even the Garments are simplified. (we except Court Suits, which never vary, and which can only remind us of the suits of our fathers.) Everything is changed: Women are no longer coiffed en cheveux; they wear Hats or Caps. Their throats and necks are no longer uncovered. More culs postiches; they hardly wear little coudes with pockets to give a certain fullness. All apply themselves today in having a svelte and narrow waist. All that has been saved of the former dress, are the Stays for shrinking the waist, and the full Gown Trimming. 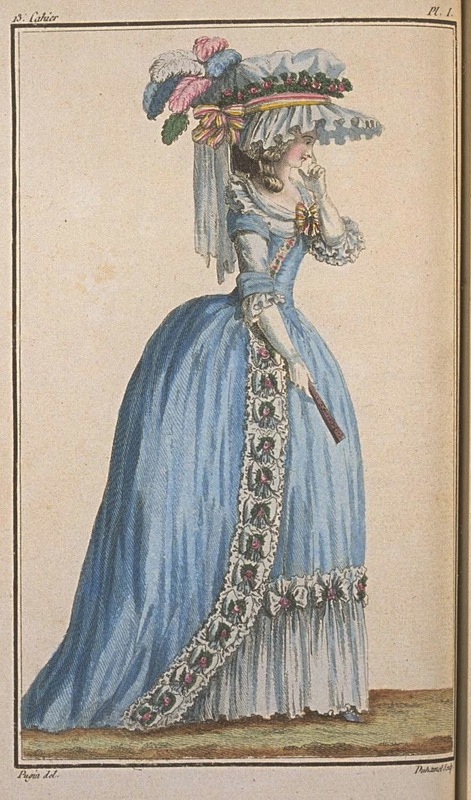 The Gown that the Woman represented in the 1st Plate wears is a Robe à la Turque of blue Pekin. The Petticoat is of the same fabric and in the same color. 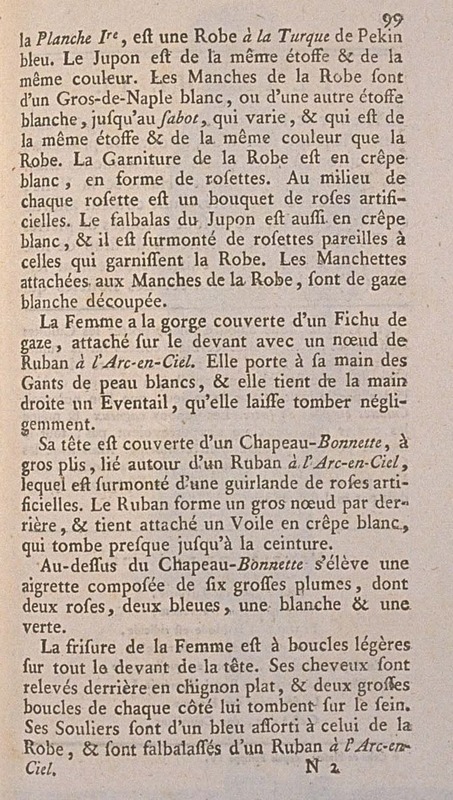 The Sleeves of the Gown are of white Gros-de-Naples, or another white fabric, to the sabot, which varies, and which is of the same fabric and the same color as the Gown. The Trimming of the Gown is in white crêpe, in the form of bows. In the middle of each bow is a bouquet of artificial roses. The flounce of the Petticoat is also of white crêpe, and it is surmounted by bows matching those trimming the Gown. The Manchettes attached to the Gown Sleeves are of pinked white gauze. The Woman has her throat covered with a gauze Kerchief, fastened in the front with a bow of Rainbow Ribbon. She wears on her hands Gloves of white leather, and she holds in her right hand a Fan, that she allows to fall negligently. Her head is covered with a Chapeau-Bonnette, in large pleats, tied around with a Rainbow Ribbon, which is surmounted with a garland of artificial roses. The Ribbon forms a large bow in the back, and holds attached a Veil in white crêpe, which falls almost to the waist. Above the Chapeau-Bonnette rises an aigrette made of six large plumes, of which two are pink, two blue, one white, and one green. The Woman's hair is in light curls over the whole front of her head. Her hair is pulled up behind in a flat chignon, and two large curls on each side of it fall on the chest. Her Shoes are a blue matching that of the Gown, and are flounced with a Rainbow Ribbon.